Office Ninja: Best. Week. Ever. So how was your week? Mine was pretty cool. After lots of blood, sweat, tears, and patience, Office Ninja is finally released to the world (sorta)! On Tuesday, April 22nd, it was available to buy/rent on iTunes. Unfortunately, as of now it's only available in English-speaking countries around the globe. We released a press release that got some buzz. To celebrate the release, I had Robb Padgett (who played Jett) & his life/creative partner Tanya Ihnen on this week's PTMG Podcast, and talked about the movie and other topics, including the hilariously sad fate of the pants he wore in Office Ninja. Catch it on YouTube or iTunes. Also, a couple of positive reviews were posted, thanks to Skye Kilaen of Jinxatron Planet and Alicia Glass of Krypton Radio. We'll keep you posted as the reviews roll in! It's been a busy week, but we're far from done. There's more reviews to wait, more people to spam, more work to do to get it onto DVD and other digital platforms. Stay tuned next week as we have Jade Carter (Tomas) on PTMG Podcast. Thanks for reading and supporting. 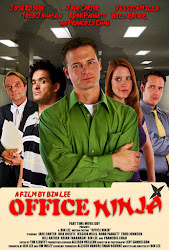 And please check out Office Ninja on iTunes, it only costs $8 to buy! Office Ninja is Officially on iTunes! Pre-Order Office Ninja on iTunes!